Small Business Friends directly support the Festival’s free programming and receive exciting benefits all summer long such as color advertising online and in our printed program, a promotions night in the Friends Tent, express entry at the gate, access to the Friends Seating Area and Friends Tent, complimentary tickets to benefit concerts, and more! 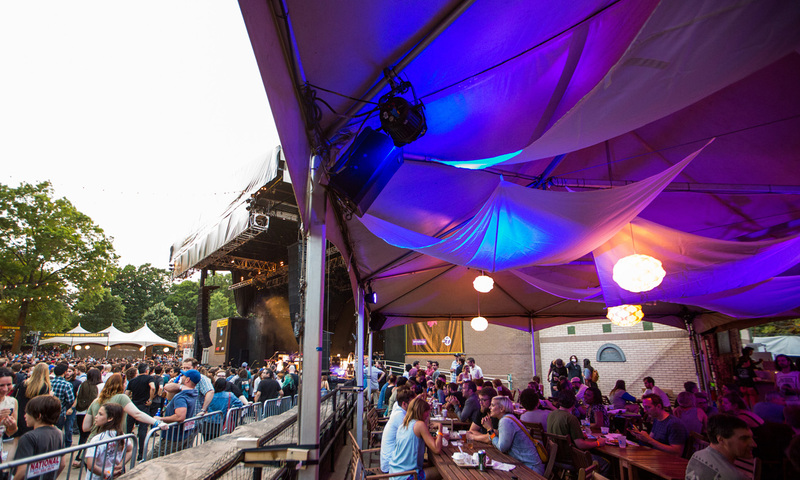 Over 175,000 people attend the BRIC Celebrate Brooklyn! Festival every summer. Don't miss your chance to showcase your small business! BRIC is committed to strengthening neighborhoods and communities. This means providing valuable support and exposure to Brooklyn’s beloved "mom-and-pop" shops. Small Business Friends, therefore, are defined by BRIC as any local business with less than 25 employees and three locations. BRIC Large businesses are welcome to check out our corporate sponsorship opportunities. To find out more about sponsorship, corporate hospitality, and advertising opportunities, click here. The ad deadline for Small Business is May 1, 2019, so don't miss your chance! Check out the variety of options below to pick the benefits you want most. In 2018, BRIC hosted our first-ever Small Business Networking Night at the Bandhsell. The event was such a success that we decided to make this an added perk for Business Friends beginning in 2019. During this special night, Business Friends will be invited to a private event to mingle and get to know other small business owners in our community, complete with complimentary drinks and hors d'oeuvres. We hope you can join us for this special night! Get These Great Benefits! Numbers represent quantity of people. Benefits include: Members-First Notification of BRIC House Programs; 15% discount on Community Media Classes; 10% discount at the café in BRIC House; Advance BRIC House Ticket Sales and Reservations; and Discounted Tickets to the BRIC Fall Gala After Party. To find out more about BRIC Membership, click here. Kids 2 years of age and over must have a pass. Complimentary tickets are available on a first-come basis, while (limited) supplies last. We strongly recommend reserving your tickets well in advance of the show. Numbers represent total comp tickets per summer. Friends seating is in the front rows, except during benefit concerts and other select performances when seating is further back, by the sound tower. Friends seats are available on a first-come basis at each event. We strive to make sure there are enough seats for members. There is no Friends seating on Opening Night due to the Gala fundraiser. The Friends Tent (9th St.) is always open to Small Business Friends, except on Opening Night due to the Gala fundraiser. The Sponsor Tent (11th St.) is open to members whenever possible. We will let you know online and onsite when it is available to Friends. Small Business Friends are invited to the Opening Night Gala After-Party in the Friends Tent following the performance. Contact us at 718.683.5636 or membership@bricartsmedia.org.